This cartoon by Lauren Purje on Hyperallergic sums it up nicely, I think. Facebook is now offering brands and marketers the opportunity to pay to get their posts seen more through something called “promoted posts.” You pay a few bucks and ensure that your latest update will get seen by more of your audience. I knew it was coming — I was in a test group that played around with this new functionality and at the time, I thought nothing of it. Social media is a huge battle for attention, and any little thing that could give you an edge is a nice bonus right? Wrong, according to the uproar that caught me very much by surprise when Facebook rolled out the new feature a few weeks ago. “Now your fans only see a fraction of your updates,” I was told. (Never mind the fact that this has always been the case). “Facebook is making you pay for the fan engagement you are entitled to,” seemed to be the undercurrent of a lot of the dismay I saw in the blogosphere. Every time Facebook makes a change, people get really upset. Brand marketers invested lots of time and energy developing incredible “custom landing pages” and then Facebook switch to timeline and those pages went away (and so did brand engagement overall, it seems). I am so used to it I can’t get upset. Really. Free Advertising $$$ from Twitter and Amex: Here’s How to Get It! So I’ve been on Google+ for a couple of weeks now, and I think my reaction is a bit like everyone else’s–it seems like there’s potential there, but for now, it feels like the party hasn’t really started. It’s got features that potentially make the public and private sharing of data easier. That’s music to the ears of those chagrined with Facebook’s closed and rather rigid system. It looks pretty nice and clean. The Google+ button that’s been out on the web finally seems to make sense. At work last week, we published a blog post by two of my colleagues, Gilad and Devin. 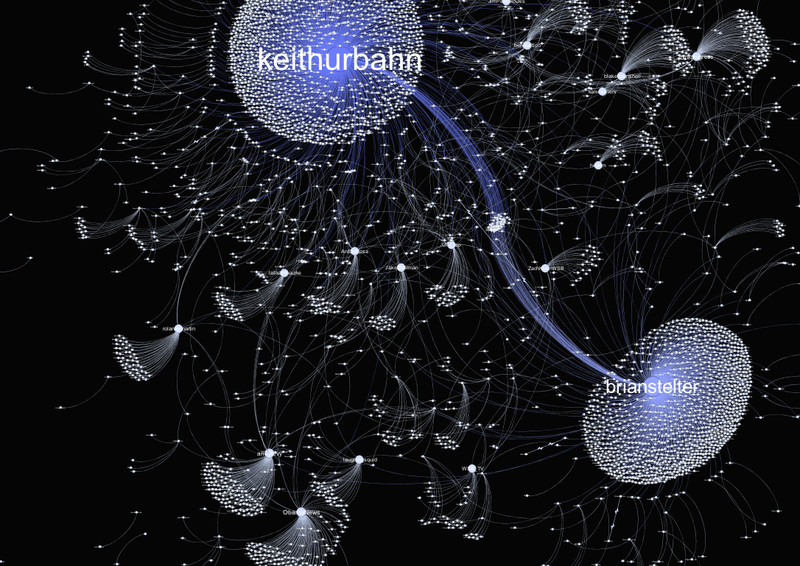 It was a visualization of how one guy’s tweet about the Bin Laden raid captured the attention of the Twittersphere. He wasn’t the first to Tweet the info, and he wasn’t the most followed Twitterer in the world, so why did his tweet take off like wildfire? If you’ve ever wondered why some things go viral and other don’t, Gilad and Devin’s piece is a really interesting way of looking at a set of interrelating factors. On Friday, it was hard to not keep hitting “refresh” on my HootSuite application to see the reaction to our blog post. By Sunday, the post had garnered more than 1600 tweets, many in German, French and Japanese. I had never seen anything like it. The nearest experience I have ever had is launching Scott Foundas’s review of The Social Network (the web’s first), as a part of the website that I created for last year’s New York Film Festival. That piece, too, went viral off a single tweet, and had the same sort of “meta” quality, being a story about the social web. But this experience really blew me away. Part of what SocialFlow looks at on a daily basis is how social conversation ripple, peak and subside in an environment with a very high volume of activity, Twitter. Everyone wants to know how to make something go viral, but in an interlocking social space like the web, the scale and speed of information flow can make it seem impossible to get heard. And yet various individual and ideas do it all the time. Figuring out why is the really interesting part. It was visual. It took something really huge in scale (the vast amount of Twitter activity that transpired before, during an after the Bin Laden announcement) and made it into something tangible. It told a story. The story of the post is about how one single individual, Keith Urbahn, made a humongous impact. It was “about” Twitter so naturally people wanted to Tweet about it. Be visual, tell a story, and give people something to tweet about won’t guarantee you’ll be a hit, but fundamentally it’s pretty good advice for blogging in general.